Adam Lambert – It Got Better! You are here: Home / Adam in the Media / Adam Lambert – It Got Better! Adam Lambert took part in the It Gets Better campaign and has done a follow up interview, stating “It Got Better.” The It Gets Better project is commemorating five years of progress for LGBT youth. Enjoy this wonderful interview and maybe pick up something new! Love ya! Especially today when I’ve received so many thoughtful birthday greetings from the Glamberts! Thank you!! I didn’t know it was your birthday, but I hope you had a wonderful day celebrating with those you hold dear—and thank you for all you do for us on this blog. It has been a special resource for keeping us close to Adam and I appreciate all you do. Thank you Lorraine! It was a wonderful day! Happy belated birthday, Carol. Just resubscribed to this website & glad I did. Thoroughly enjoyed this interview with Adam. Just adore him. He’s just so himself. Thumbs up Adam! Thank-You Carol as always. I listened and watched Adam telling his story. I have loved him from the first day I set eyes on him. And No, No I do not ,nor will I ever judge him because he is gay. I loved him when I found out. I was like he is so handsome and so talented. I just love him anyway. Didn’t matter to me! He is such a wonderful person. His singing is amazing! 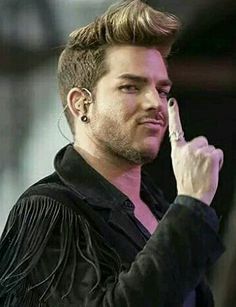 I love you Adam Lambert! And I always will. You are who you are and that is no shame. I know that you know that and are comfortable with it! So am I. And I hope tons of your fans feel the same way. Matter of fact I know they do! Thank-You for sharing your story with us!